“We realize how important it is for our kababayans abroad to get in touch with their families especially during calamities. This is why we have set up free calling stations in these 8 countries where Globe is directly serving the Filipino communities there,” Genio said. “In Italy, free calling services are available at the Globe Stores in Milan and Rome. For Spain, UK, Saudi Arabia, Canada, Singapore and Hong Kong, this public service started yesterday and is being offered through some of the accredited Globe retailers in those countries,” said RizzaManiego-Eala, Globe Senior Vice President for International Business. “For the United States, LibrengTawag in the west coast will be available in all branches of Seafood City through our partnership with them while Filipinos in the east coast will be served via web through the subscribed access service of Lunex, the Globe partner servicing the area,” Maniego-Eala added. LibrengTawag will be available until 11:59pm EST on 08 December 2014. 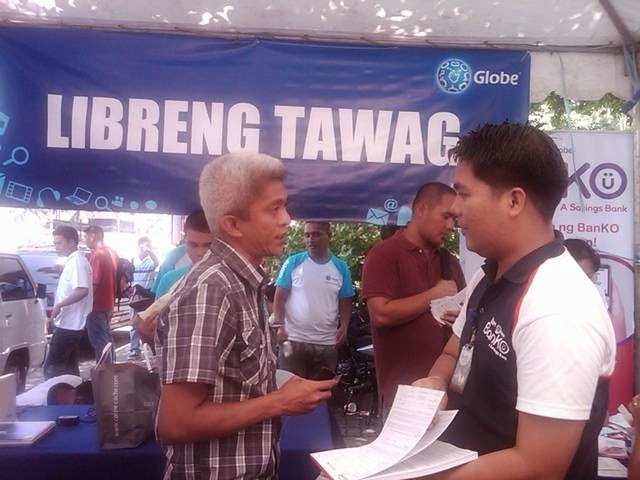 Globe has started offering Libreng Tawag and Charging services at Peerles Subd. entrance, Brgy. 93 Bagacay in Tacloban, Leyte from 4 pm to 7 pm of December 8. The services will be made available from 8 am to 6 pm on December 9 and 10. Other areas affected by Typhoon Ruby to follow.